For small estates, Washington law permits you to use a process to acquire the property of a decedent without the need for a probate. In general, to use this process, someone must have died with no more than $100,000 of probate assets (for a discussion about the difference between probate and nonprobate assets, visit the nonprobate assets page). But even for estates that are less than $100,000, it may still be impossible to use this process, or it might not be the best option for you. The material below outlines the steps to follow in using a small estate affidavit, as well as discusses some of the risks in using the small estate affidavit and other issues that arise with small estates. 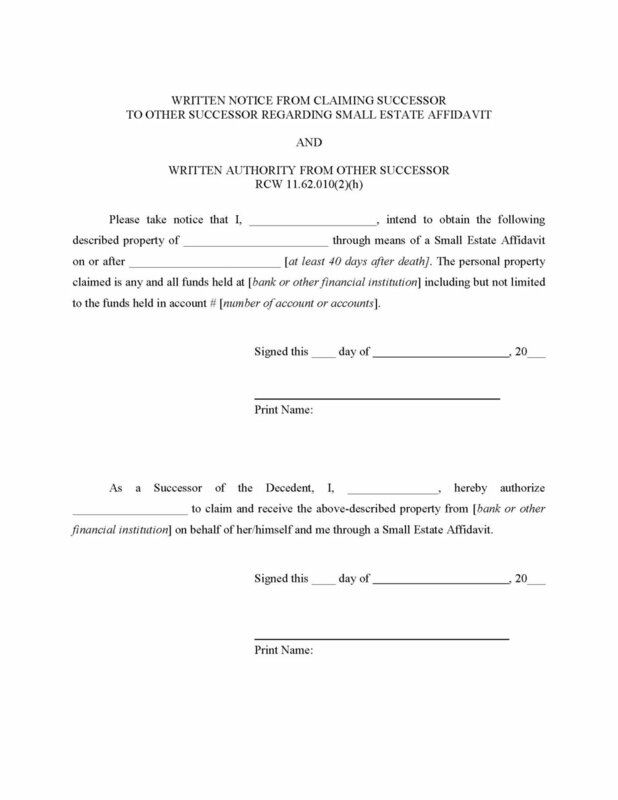 Washington law permits the use of a small estate affidavit in certain circumstances. Before using a small estate affidavit, you should first ask whether the deceased friend or family member had more than $100,000 in probate assets. If they did, you can probably use this process. However, you should also ask whether they owned any real property (i.e., land or real estate). If the answer is “yes,” then using a small estate affidavit may not be the best choice. While a small estate affidavit may be used for a decedent who had real property, the affidavit cannot be used to transfer title to the real property. Furthermore, the equity in the real property is used toward the $100,000 calculation. Therefore, it is rare when you could or would want to use the small estate affidavit process if your loved one died with real property. In those cases, you'll probably need a probate. If you decide to use the small estate affidavit and present it to a person or financial institution that is holding the assets of your loved one, that person or financial institution is supposed to deliver the asset to you. The person or financial institution that held the asset will be discharged and released from any liability in the same way as if it had been dealing directly with the personal representative of an estate. The holder of the asset has no obligation to inquire into the truth of the material in the affidavit, however, he or she cannot ignore facts known to be untrue. You must be a “successor,” as that term is defined in the small estate affidavit statute. You are a successor if you are entitled to the asset in question under the will of the decedent or under Washington’s law of intestate succession (RCW 11.04.015) if there was no will. If you are a surviving spouse, you are also a successor at least to the extent of your community property portion of the asset being held. Your loved one must also have been a resident of the State of Washington at the date of death. No application or petition for the appointment of a personal representative or estate administrator is pending or has been granted in any jurisdiction. All debts of the decedent including funeral and burial expenses have been paid or provided for. You have given advance notice to all other “successors” of your intention to obtain the asset of the loved one and they have provided you written authorization to do so. A sample of such a document can be viewed on the left, and downloaded here. First, you must wait at least 40 days after your loved one has died before submitting the affidavit. Second, you are required to mail a copy of the affidavit, along with the decedent’s social security number, to DSHS’s Office of Financial Recovery, whose address is currently: P.O. Box 9501, Olympia, WA 98507-9501. As you can see from the discussion above, even when all of the statutory requirements are met, the small estate affidavit process might be impossible or impractical to use. If you are not entitled to all of the assets, you must get written authorization from others who also have a right to the property. This may be impossible when another heir is uncooperative. Even with such authority, the family relationships may be so bitter that you should consider first whether you are willing to take the risk of acquiring the particular asset and then being answerable to the heirs for dividing it appropriately. You will likely need to pay bills before dividing it. Your disgruntled family members might accuse you of stealing some of the assets. Whether you have a cooperative family or not, you should keep good records of the assets you have received and bills you have paid. If the family relationship is too acrimonious, you should consider conducting a probate that will provide a more formal structure. Hiring an attorney in this situation can avoid a lot of headaches and sleepless nights. In Washington, surviving family members are not responsible for the debts of their deceased loved ones. However, if you take their assets and property through a small estate affidavit or in any other way, you’re on the hook, at least to the extent of the value of the assets you took. So be careful and analyze whether your loved one had much debt. It may not be worth the risk. When using the small estate affidavit process, you are responsible for ensuring that the debts of the decedent have been waived, paid, or arrangements for their payment have been made. Before proceeding with a small estate affidavit, review the decedent’s records, mail, or belongings for any debts that exist. You may also consider filing and publishing a Nonprobate Notice to Creditors. You are not required to do this, but this might put your mind at ease and avoid future liability for unpaid debts. The process for filing a Nonprobate Notice to Creditors is outlined in chapter 11.42 of the Revised Code of Washington, and is similar to the creditor claim process for estate that are being probated. For a discussed on that process, visit the page on Creditors. Vehicles. The Washington State Department of Licensing has its own form for the transfer of vehicles when no probate has been started. It is called an Affidavit of Inheritance/Litigation and can be found easily online. Even though RCW 11.62.010(3) seems to authorize the use of a small estate affidavit to change the ownership certificate and licensing registration of a vehicle, you should use this accepted form on the DOL’s website. Wages. A spouse, child or parent (in that order) may request a deceased employee’s unpaid wages up to $2,500, as long as no personal representative has been appointed. RCW 49.48.120(1). The employer should require proof of the claimant’s relationship through an affidavit or declaration and require receipt of the payment in writing. If the employer follows these rules, it will be released from liability to the decedent’s estate for the payment. RCW 49.48.120. If the employee was employed by Washington State or any municipality in Washington, which is broadly defined to include virtually any government employer, there is no cap on the amount of wages that the employer can release to the spouse, child or parent. RCW 49.48.120(2). Taxes and Tax Refunds. Among the decedent’s debt could be taxes owed to the IRS. You can file a Form 1040 for a deceased taxpayer even when no personal representative has been appointed. If there is a refund owed, you can file a Form 1310, along with the Form 1040, and receive the tax refund due to the deceased taxpayer. On the Form 1310, you must assert that you will pay out the refund according to state law. Do you have the original will? If you don’t plan to begin a probate, you're still required to file the original will with the Court if you have it in your possession and you know the person who executed it is deceased. By just filing the will, this doesn’t start a probate. The case is dormant and no further action is taken. Under RCW 11.20.010, if you have the original will in your possession and you are the personal representative named in the will, you must file it with the Court no later than 40 days after the testator’s death, whether you plan to start a probate or not. If you are not the personal representative named in the will and you have the original in your possession, you have 30 days after the date of death to file it with the Court. To file the will, you should go to the Superior Court Clerk’s office in any Washington Superior Court and file it there. In King County, the Clerk will require you to pay $20 to do this. Bring the original will and a copy, along with a completed Case Designation Coversheet (check “Will Only” on the second page). The Clerk will stamp a case number on the original will and file it. You should stamp your copy with the case number and date-received stamp and keep it for your records. Some people instead like to purchase a certified copy of the will from the Clerk.